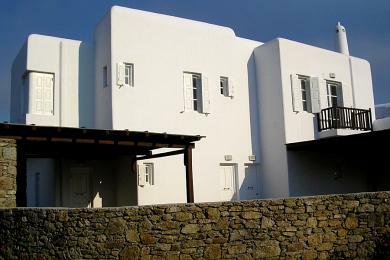 ﻿ Villa - For Sale - KYKLADES, MYKONOS KOUNOUPAS - Mykonos Realty. Kounoupas, luxurious ground floor villa 190sq.m to the side in a luxurious complex with independent entrance, consisting of the main building with three bedrooms, each with its bathroom, sitting area with fireplace, open-plan dining/kitchen area and one extra bathroom. Moreover, there is an independent guest house in an independent building with one bedroom with sitting area, kitchenette and bathroom with its own outdoor entrance. Fully furnished and equipped, air condition, decorated with first class materials and very good taste. Big verandah and big pergolas. Swimming pool for common use. Fantastic panoramic and unobstructed view to the Aegean Sea, Delos, and the magic sunset.